LASIK (laser in situ keratomileusis) is a surgical procedure designed to correct refractive errors. LASIK involves creating a corneal flap using a microkeratome (Figure 1), reshaping the cornea using an excimer laser to remove tissue from the underlying stromal bed and then replacing the flap. Figure 1. Lifting of LASIK flap. LASIK evolved from a variety of techniques in refractive surgery. Keratomileusis, with both freeze and non-freeze techniques was used in the USA in the 1970s. This procedure was followed by automated lamellar keratoplasty (ALK), in which a microkeratome was used to create either a free cap or a hinged corneal flap. Tissue from the corneal bed was removed to alter the refractive error and the flap was replaced. Keratomileusis and ALK were relatively imprecise mechanical techniques. After the ophthalmic excimer laser was developed, it was used to reshape the cornea in a technique called photorefractive keratectomy ( PRK ). LASIK combines the technique of creating a hinged corneal flap from ALK with excimer laser ablation from PRK (Figure 2). Potential advantages of LASIK over PRK include earlier postoperative stabilization and faster improvement of visual acuity; less postoperative patient discomfort; shorter duration of postoperative medication use; and an easier enhancement procedure. Figure 2. 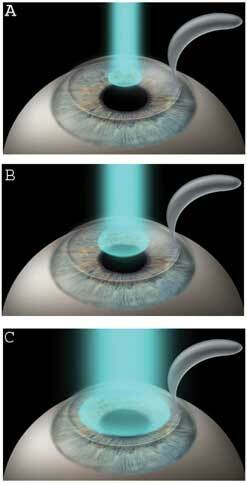 Illustration of excimer ablation of the stromal bed in myopic LASIK. LASIK is indicated for the correction of low, moderate, and high myopia with and without astigmatism. The specific dioptric limits depends on the specific laser system and the regulatory agency of each country. In the U.S.A. the approved indications can be found on the Food and Drug Administration (FDA) labeling. The correction of high myopia may present a greater risk of post-LASIK ectasia and decreased quality of vision in some patients. The surgeon and patient should decide whether LASIK is indicated based on a full preoperative evaluation and consideration of goals and alternatives, including spectacles, contact lens, and phakic intraocular lens implantation. Preoperative evaluation should include a complete eye examination, a full medical and ophthalmologic history, and informed consent. Dry and cycloplegic refraction should be performed for all patients. Rigid contact lenses should be removed for several weeks and soft lenses for several days to weeks before examination. Refraction should be stable within 0.5 D for 1 year or more before LASIK surgery. Measurement of corneal topography is essential, and is used to screen for irregular astigmatism, keratoconus and forme fruste keratoconus which are associated with unpredictable refractive outcomes and progressive ectasia (bulging of the cornea) after LASIK. Measurement of corneal thickness is also critical in the preoperative assessment for LASIK because of its importance in the calculation of anticipated residual stromal bed thickness. A thin cornea may also be an indication of subtle keratoconus, and indicates a need for caution in tissue removal. Other tests which should be performed include measuring pupil size and eye movements. Fuchs corneal endothelial dystrophy, corneal epithelial basement membrane dystrophy, peripheral retinal tears, especially in highly myopic eyes, systemic autoimmune disease, pregnancy, lactation, severe dry eyes, and significant blepharitis which should be treated prior to surgery. LASIK flaps are cut with either mechanical microkeratomes or femtosecond lasers. Mechanical microkeratomes are typically labeled for nominal cut depths of between 120 and 180 µm. There is a trend to cut thinner flaps with the newer microkeratome models, which are more precise. Thinner flaps preserve greater stromal bed thickness and reduce the risk of ectasia. Femtosecond lasers tend to create more precise and uniform flap thickness, and settings of 100-120 µm are typically used. A residual posterior stromal thickness of at least 250 μm is recommended to reduce the risk of post-LASIK ectasia. Some surgeons also believe that the stromal bed should be at least half of the original corneal thickness. To help ensure an acceptable final postoperative residual stromal thickness, flap thickness can be measured by intraoperative ultrasound pachymetry. Anterior segment optical coherence tomography (OCT) can be used to measure flap and stromal bed thicknesses (Figure 3). Flap thicknesses can deviate significantly from the nominal setting and routine measurement can help the surgeon evaluate the range of actual thickness obtained. Figure 3. Optical coherence tomography (OCT) image of a LASIK flap showing measurement of the flap and stromal bed thickness. The upper numbers represent the transverse distance from the corneal vertex in millimetres. The lower numbers represent flap thickness and residual stromal bed thickness in microns, respectively. Before surgery the excimer laser, suction ring, microkeratome and blade (or femtosecond laser settings), are checked by the technician and the surgeon. The surgeon also confirms that the correct treatment data are entered into the laser computer. An eyelid speculum is placed in the operative eye, which has been anesthetized with drops, and the fellow eye is covered. The cornea is marked to aid in postoperative flap alignment. A suction ring is placed on the eye to achieve fixation. 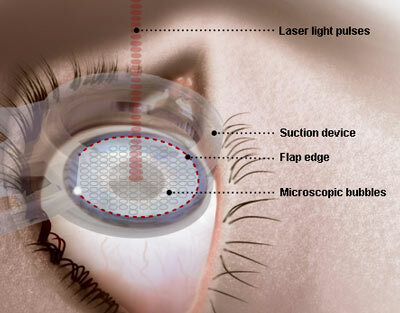 The microkeratome (or femtosecond laser) is used to create a hinged corneal flap. After the flap has been created, it is reflected away from the cut surface. Excimer laser ablation is performed, centered on the pupil. Eye-tracker and iris registration technology are increasingly used to ensure a well-centered laser treatment. Following the excimer laser, the flap is replaced. Patients may have mild postoperative discomfort for 4 to 6 hours following LASIK treatment, during which time they should keep their eyes closed and rest or take a nap. Patients should not rub their eyes after surgery. Steroid and antibiotic drops are used for 4 to 10 days after surgery. Preservative-free tears may be used for weeks to months depending on dry eye symptoms and corneal punctate staining. Refractive stabilization for myopes take up to 3 months depending on the amount of treatment performed. 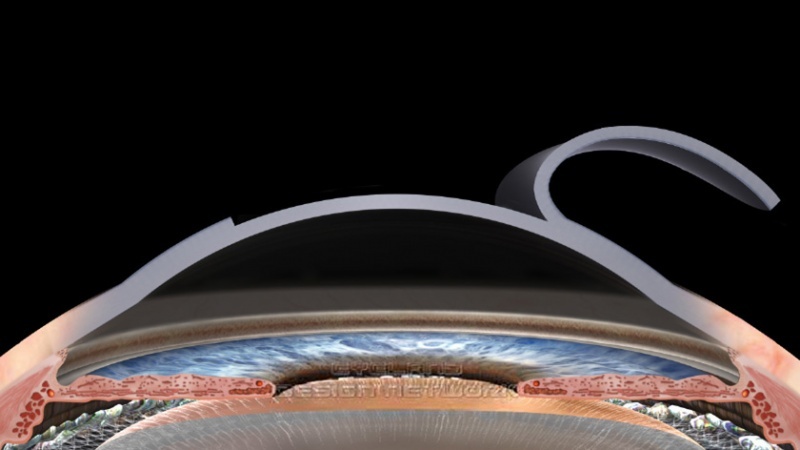 Residual refractive error can be corrected after stabilization, typically by relifting the flap and ablating the stromal bed in a retreatment procedure (also called an enhancement). To ensure preservation of at least 250 μm of residual bed thickness after laser retreatment, preoperative OCT or intraoperative ultrasound pachymetry could be performed. For the correction of low to moderate myopia of less than -6D and low to moderate astigmatism of less than 2D, results from studies in the literature have shown that LASIK is effective and predictable in terms of obtaining very good to excellent uncorrected visual acuity and that it is safe in terms of minimal loss of visual acuity. For higher degrees of myopia and astigmatism, the results are more variable. Complications occur in LASIK as in any other surgical procedure. Serious adverse complications leading to significant permanent visual loss occur rarely. Less serious side effects such as dry eyes, night time starbursts, and/or reduced contrast sensitivity occur relatively frequently. The most common complication or side effect following LASIK is dry eyes. Complications involving the LASIK flap include free, incomplete, or buttonholed flaps, striae/folds or slipped/displaced flaps. If the flap created during the LASIK procedure is irregular, incomplete, or buttonholed, laser treatment cannot safely be performed in the same session. However, after a healing period, a secondary LASIK or PRK procedure may be performed in some cases. Complications that occur at the level of the interface between the flap and the stromal bed include diffuse lamellar keratitis, infection, and epithelial ingrowth. Post-LASIK ectasia may occur as a result of a residual stromal bed that is too thin or from an inherent predisposition of the cornea to distortion. It is uncertain if there is any relationship between LASIK and an increased incidence of postoperative retinal detachment. Ischemic optic neuropathy is a rare complication that has been reported following LASIK. 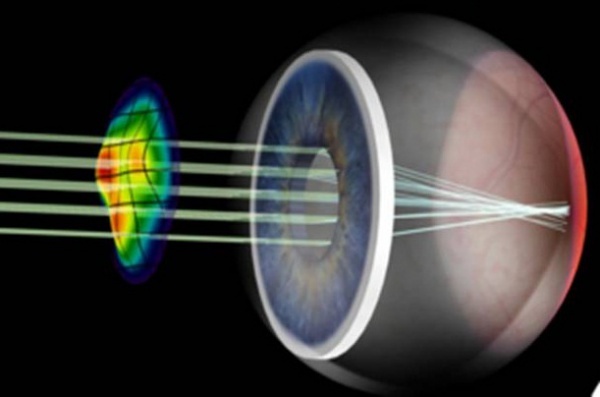 Wavefront-guided LASIK, also called custom LASIK, is a variation of LASIK where the excimer laser ablates a sophisticated pattern based on measurements from a wavefront aberrometer (Figure 4). The goal of WFG LASIK is to achieve a more optically perfect ablation based on all of the optical aberrations measured using a wavefront aberrometer, not just spherical and cylindrical refractive errors. The data from published studies indicates that WFG LASIK is both safe and effective. In comparison to conventional LASIK, WFG surgery appears to result in improved outcomes, particularly in contrast sensitivity, night vision, and visual symptoms. Figure 4. Schematic of wavefront technology, showing a wavefront pattern. The femtosecond laser creates a corneal incision by delivering laser pulses at a predetermined depth in the cornea. These pulses cause microphotodisruption, an expanding bubble of gas (CO2) and water that cleave the tissue and create a plane of separation (Figure 5). Compared to conventional mechanical microkeratomes, femtosecond lasers create LASIK flaps with more predictable and uniform thickness, and fewer complications. However, side effects unique to the femtosecond laser, such as transient light sensitivity syndrome, have been reported. Femtosecond laser aided LASIK has been shown to provide better predictability of refractive outcomes and lower enhancement rates than LASIK performed using a microkeratome. Figure 5. Illustration of a femtosecond laser cutting a LASIK flap. LASIK is an excellent procedure for many, but not all, patients with myopia and astigmatism. Some patients are not good candidates for a variety of reasons, and these patients should be counseled against surgery. Surgical complications are rare, but do occur. Good postoperative care is important. American Academy of Ophthalmology. LASIK. American Academy of Ophthalmology. EyeSmart® Eye health. https://www.aao.org/eye-health/treatments/lasik-2. Accessed March 26, 2019. 1. Sugar A, Rapuano C.J., Culbertson W. W., Huang D.,Varley G. A., Agapitos P.J, de Luise V.P., Koch D.D. Laser In Situ Keratomileusis for Myopia and Astigmatism: Safety and Efficacy. A Report by the American Academy of Ophthalmology. Ophthalmology 2002;109:175–187. 3. Stonecipher K, Ignacio TS, and Stonecipher M. Advances in refractive surgery: microkeratome and femtosecond laser flap creation in relation to safety, efficacy, predictability, and biomechanical stability Curr Opin Ophthalmol 2006; 17:368–372. This page was last modified on March 26, 2019, at 15:31. This page has been accessed 99,105 times.